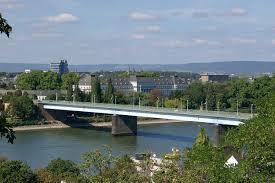 The town of Koblenz is located in a lovely, picturesque setting of the landscape of the Rhine and Moselland. This 2000-year-old town is surrounded by four low mountain ranges. There are many cultural monuments, historic buildings and river promenades for strolling. 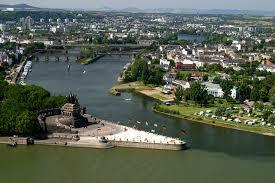 The Deutsches Eck or German Corner is a spit of land at the confluence of the Rhine and Moselle Rivers. It was named by the Teutonic Order of Knights when the settled here in 1216. 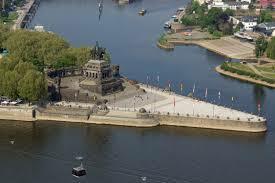 A monument to Kaiser Wilhelm I was built, commemorating the unification of the German Empire. Destroyed during the war this monument was reconstructed in 1993. The monument stands 37 meters high and attracts over 2 million visitors annually. 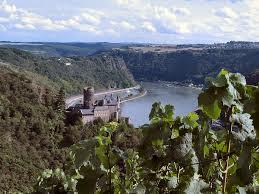 Since 2002 it has been part of the Upper Middle Rhine Valley UNESCO World Heritage site. Ehrenbreitstein Fortress stands 118 meters high over the Rhine. From the fortress you can get fantastic views of Koblenz, the surrounding vineyards and the confluence of the Rhine and Moselle Rivers. This is the second largest preserved fortress in Europe and was built between 1817 and 1828. 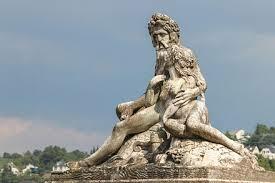 Its origins date back to 1000 AD. It is open to the public along with some excavation parts. 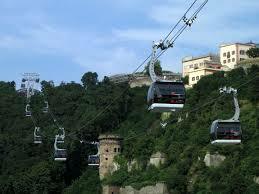 Visitors can take a breathtaking ride up to the fortress by aerial cable car. The cable car measures about 850 meters and can carry 7,600 visitors per hour. This cable car is one of the largest of its type in Europe outside of the Alps. It was built for the National Garden Show in 2011. There are 18 cable cars offering awesome views of the Upper Middle Rhine Valley. 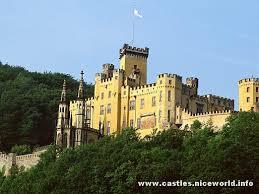 A masterpiece and an important symbol of Romanticism on the Rhine is Stolzenfels Castle. Visitors can see the gate building, Gothic residential tower, main castle building with the vaulted banqueting hall and pergola gardens. Some parts of the castle feature furniture, paintings and sculptures that date from the 16th to the 18th century. In the banqueting hall you can see a collection of historical weapons and flags. Other highlights include wall paintings in the chapel. One of the oldest and most magnificent cultural landscapes in all of Europe is the Upper Middle Rhine Valley. The valley is considered to be the epitome of Romanticism on the Rhine. This is a section of land about 65 kilometers located between Koblenz and the towns of Bingen and Rudesheim. In 2002 it was awarded UNESCO World Heritage Site status. Here you can find wonderful castles, fortresses and places. Forum Confluentes is a new arts and cultural center that was built in the heart of the city’s central square. 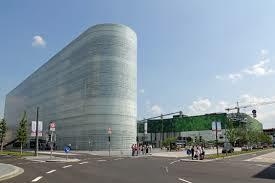 This unique building is home to the Middle Rhine Museum displaying information about the city’s history. There are exhibitions of Middle Rhineland sculptures from the 13th to the 16th century and painting from the Baroque and Romantic periods. Visitors also enjoy the Romanticum, an interactive attraction that gives a virtual cruise along the lovely Middle Rhine Valley, providing information about the region’s major castles and their inhabitants. Here you’ll also find the city’s main Tourist Information Center with a large model highlighting the city’s main tourist attractions. The Deutschherrenhaus is home to the Ludwig Museum. 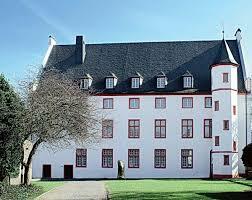 It was the first settlement of the Teutonic Order of Knights in Rhineland. The building faces the Kaiser Monument, the memorial to Wilhelm I. The museum features a unique collection of today’s art especially that of France. The 12th century castle Alte Brug stands on the banks of the Moselle. 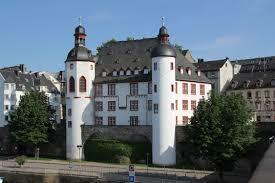 The castle once served the Electors of Trier while they struggled to subject the locals to their rule. 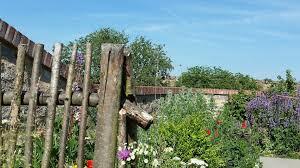 It is surrounded by a tall wall with some parts dating back to Roman times and a wide moat fed by the Moselle. Today the castle is home to the city’s Municipal Archives and Library. In the Langemarck Barracks you can see an interesting collection of small arms, cannons, vehicles and uniforms. Built by Archbishop and Elector Balduin from 1337 the Balduin Bridge once had 14 arches and now has 11. Parts of the bridge are still on wooden piles. There is a stone statue commemorating the archbishop. The Old Town center of Koblenz was restored after WW II. Visitors can enjoy taking a walk through it and enjoy all it has to offer. 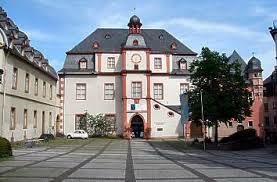 Some of the highlights include the Town Hall, built between 1695 and 1700. In front of the Town Hall is the amusing Schangel Fountain designed by Carl Burger in 1940. It is dedicated to poet Josef Cornelius, who wrote the lyrics for the city’s “hymn”. Visitors are also impressed by the Florinsmarkt, home to the Romanesque and Gothic 12th century Florinskirche and the Altes Kaufhaus, the Old Merchant’s Hall. 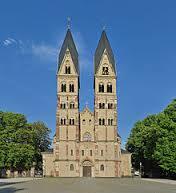 You’ll find the Romanesque Liebfrauenkirche or Church of Our Lady. The church dates from the 12th century with additions added in the 15th century. Some of the highlights of the church include the impressive Gothic choir and the Baroque towers with four bells that are famous for tolling the “Reveler’s Bell” at 10 PM every evening. Wine lovers enjoy visiting the Weindorf or Wine Village located on the banks of the Rhine. This has been the place for good wine and regional specialties for almost 75 years. This building complex consists of a genuine vineyard and half-timbered houses that came from some of the most famous German wine-growing areas. 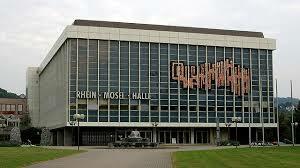 It was all built on the occasion of the German Wine Exhibition in 1925. 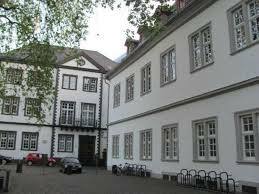 One of the city’s many landmarks is the “Pegelhaus” or Gauge House built between 1609 and 1611. Originally it housed a crane and later a water-level gauge. 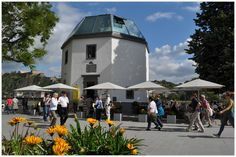 Now it is a popular restaurant and meeting sport as well as the start of the Rhine Gardens, ferry and local boat jetty. It is right across the river from the Ehrenbreitstein Fortress. 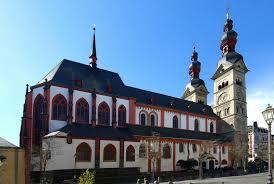 Basilica of St. Castor was founded in 836 AD and is the place where the historic Treaty of Verdun was signed in 843. Highlights here include the Dwarf Gallery with its 21 arches and images of Christ as a lion, many old tombs and a 20th century war memorial. 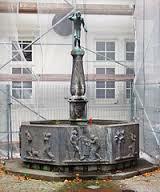 In the square in front of the church is the Kastorbrunnen Fountain built in 1812 to commemorate the Napoleonic Wars. The lovely Rhine Gardens stretches for three-and-a-half kilometers of promenade and walkways that connect the green spaces on the east bank of the Rhine. Some of the architectural high lights include the Pfaffendorf Bridge, the historic Wine Village and the Rhein-Mosel-Hall Convention Center. Visitors enjoy the beautiful riverside gardens especially the Gardens of Empress Augusta. The gardens were created for the wife of Emperor Wilhelm I and completed in 1861. Here you’ll find tree-lined pathways, sculpture gardens and colorful flowerbeds. 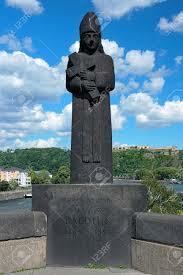 There is a large statue of Father Rhine and Mother Mosel, a 19th century monument celebrating Koblenz as the meeting place of the region’s two most important rivers. Close to the banks of the Rhine, just below the Pfaffendorf Bridge is the neo-Classical Electoral Palace, completed in 1786 by the last Elector of Trier, Clemens Wenzeslaus. The palace was built to blend in with the riverside landscape. Lots of the rooms offer fantastic views of the river and Rhine Valley. 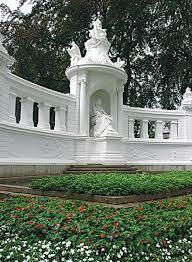 The public galleries host art exhibits and the old gardens are now part of the Gardens of the Empress Augusta. Hello Rasma, these are very exciting to see, for a while I lived in Bitburg, not far from Koblenz and visited there often, rode the cable cars up the mountainside and there was a lovely little café within sight of the castle where we would eat, sometimes at night, the lights were spectacular! Love these beautiful pictures! thank you! 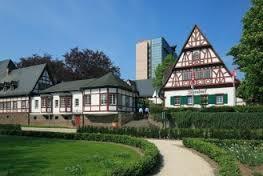 You welcome and glad you enjoyed the tour of Koblenz. it was wonderful , thanks again!